Doncaster will not have a big screen fan park for Sunday's World Cup Final. Doncaster Council has said there are no plans to show Sunday's World Cup Final on a big screen or in a fan park - should England get there. Football fever has swept the country with England on the brink of their first World Cup final since 1966 should they defeat Croatia in tomorrow night's semi-final in Moscow. Several towns and cities have created fan parks, allowing supporters to watch the action on giant screens. However, when asked on Twitter by an England fan if there were proposals to do the same in Doncaster, the council has ruled out the idea. Supporter Karl Dewsnap asked: "Is there any plans of putting a big screen anywhere in the town for the final on Sunday IF, IF England win on Wednesday? "Keepmoat? Town Fields? Cusworth Hall?" But the authority's official Twitter feed replied: "Unfortunately not. however, a list of recommended places where the games can be watched will be on our Visit Doncaster website." 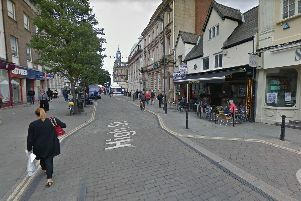 Silver Street has become the focal point for celebrating England's success with thousands of supporters decked out in red and white descending on the street for games. Tomorrow is expected to see a repeat of recent scenes which have included flares and smoke bombs being set off and fans dancing on top of bus shelters.